We are going to use the JS flowchart library as a database design tool. We will create DB tables, add rows, connect the tables and generate SQL statements that would create the tables. We reference those two libraries at the end of the HTML file, just before the closing tag. This way we are sure that the majority of the browsers will load the scripts correct. // set some Diagram properties. 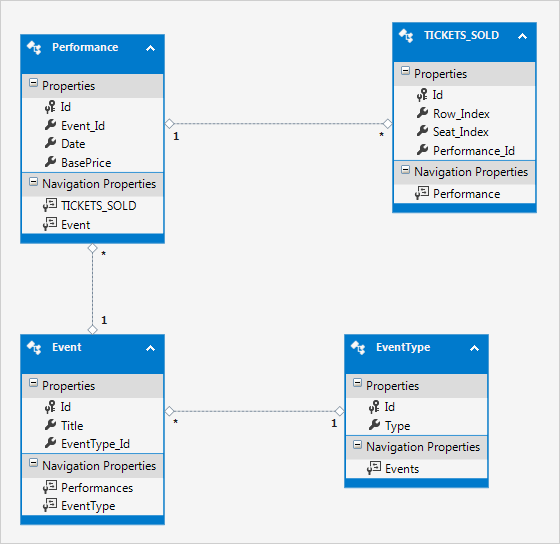 We change the default Behavior of the diagram control to “LinkTables”, which means users would be able to connect table rows. We stop users from creating self loops on tables and add some styling: the back brush is set to light gray, the head shape of links is ‘Triangle’ and we forbid the users to select multiple objects. // set the Diagram style. Link styling is done in the same way and you can find the code in the *.zip file that is available for download. The createTableNode method accepts as arguments the x and y coordinates of the new TableNode and its width and height. 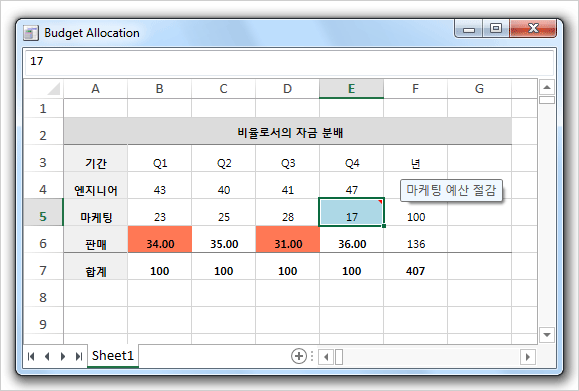 We create initially the table with two columns and no rows. By default the tables can be scrolled and the links connect table rows. When the SQL text is generated we assign it to the textarea instance that we created. If an existing cell is clicked we open the editRow form. If the caption of the table was clicked we open the form for rename of a table. If none of those, we open the form that adds a new row. Here we create the dialog that has auto height, width of 250 and two buttons: OK and Cancel. The Cancel button closes the dialog. When the user has pressed OK the form is submitted and the addRow method is called. The addRow method gets the clicked table and gets the two cells at the last row. It gets the text that was chosen in the dialog and assigns it to the cells. Then the dialog is closed and the SQL is generated once again. In this blog post we will build a photo album application. The application shows pictures organized in folders and allows the user to add new pictures, new folders as well add/delete/rearrange the photos that are already added to the folders. 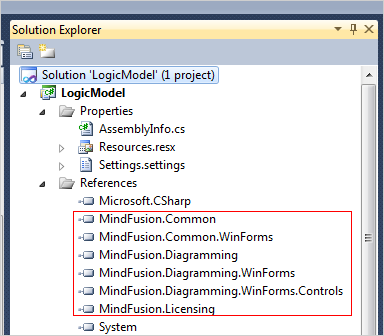 The app is built with the diagramming for WPF component. The context menu shows up every time we right-click on a node. In the code-behind file we create a Theme and add two Style-s to it: one for the links and one for the nodes. //creates a new folder with the specified text. Note that we use the Tag property of a DiagramItem to assign the text “Folder”. We will use this identification string later in the sample, to recognize that the user has clicked on a folder. 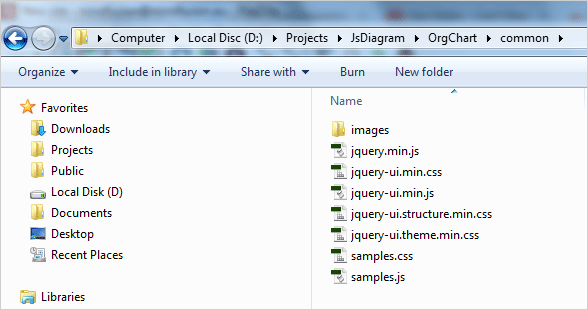 Then we need to cycle through all directories in “Images” and create subfolders for them. The method creates a node and applies some styling to it. It gets the relative Uri to the image and assigns it to the node.Image property. We use the TreeLayout algorithm to arrange our nodes in the right order. 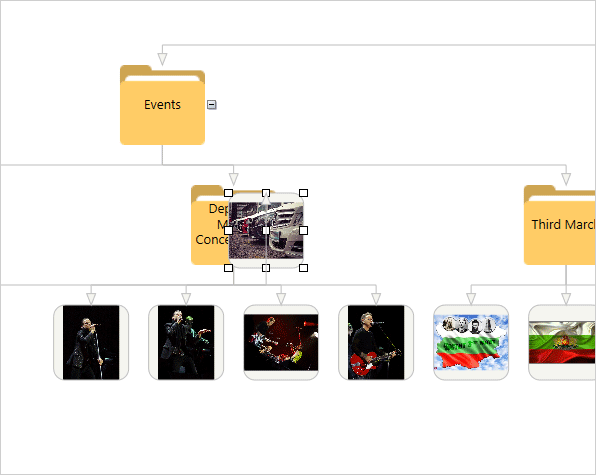 This layout is the perfect match for what we want – a hierarchy of nodes that is exactly a tree. The TreeLayout like all other automatic layouts available in MindFusion diagramming controls is pretty easy to use. It requires the call of a single Arrange method that takes as a parameter the instance of the diagram being arranged. The constructor lets you customize the layout, in our case we use this TreeLayout constructor. The constructor requires the root node, the TreeLayoutType, the next argument specifies if links are reversed, then comes the TreeLayoutLinkType, the TreeLayoutDirections and several numbers that indicate level distance, node distance and whether root position is kept. The last argument is the margins between the tree and the diagram’s bounding rectangle. We call the Rearrange method every time we modify the diagram – when nodes are added/deleted or modified. The important part in this code is to get the selected node. We will need it to specify the parent node for any new folders or image nodes that we create. Then, based on the menu selected by the user we either create a new folder node or a new image node calling the CreateFolder or CreateImage method that we listed above. Remember that we have assigned “Folder” to the Tag property of all nodes that are folders. We use this to identify them and to move the node from one folder to the other. 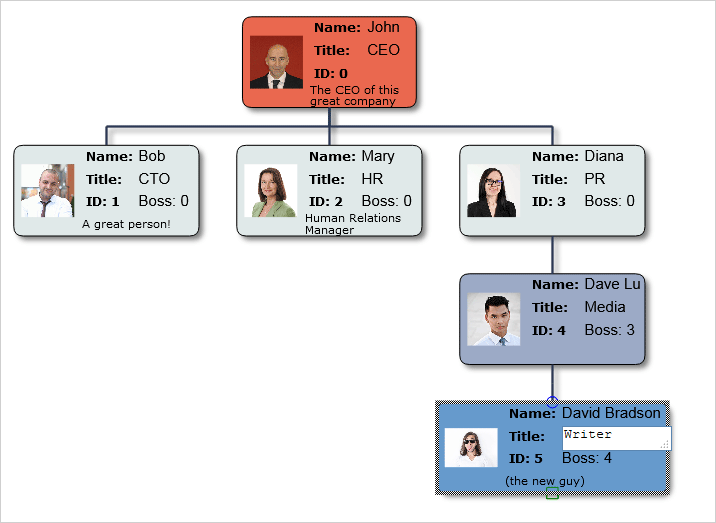 In this blog post we will use the Js Diagram library to create a beautiful organizational chart, where people from the company are represented with the hierarchy links between them. Each employee has a photo, name, position, boss and section for comments. The links between them demonstrate the hierarchy. We create a new folder for the project and there we copy the scripts that the sample uses. They are predominantly jQuery scripts, which you can also link from the jQuery CDN website. Then we create an empty (for now) js file that will hold the code-behind for the web page. It is called OrgChartEditor.js. We must reference it, from the HTML but we will do that at the end, before the closing tag. That is done because some browsers might not load correctly the scripts if they are initialize before the HTML code for the canvas. As you see, we have copied MindFusion.Common.js and MindFusion.Diagramming.js in the directory of the web page. There we have also saved OrgChartEditor.js. Note that the element has an id. That’s important because we will reference it in the code behind file. Each employee on the diagram is represented by a special node – the OrgChartNode. This node is a customized TableNode. Each OrgChartNode has a parent and a boss. The CEO, which is the topmost node in the hierarchy has no boss. The OrgChartNode is a TableNode with 3 columns and four rows. Cell(0,0) is reserved for the image of the employee. It spans 4 rows. The cells in the second column with index 1 are for labels: title, name, id and comments. We style them with bold font. When we set a new value we invalidate the canvas so that the changes can be rendered correctly on the screen. The setColor method assigns the right color for the background of the table. Different levels in the hierarchy are distinguished by different colors. The top level – the CEO – is read. The org chart allows the users to do a lot of things: edit certain table cells, delete and create nodes, create and delete links, move and drag the nodes. This is done by handling a lot of events that the diagram library exposes. Initially, the node has no boss, it will be determined once we link it to the rest of the org chart. When the node is clicked with the left mouse button – we edit it. When it is clicked with the right one – we create a new node, linked to it, one level deeper into the hierarchy. We use the cellFromPoint method to identify the cell that was clicked. The cells that cannot be edited – the ones that render the labels – have no cellEditor. In the code above we check to see if the image location is correctly set and if so – we read the new image from the url and render it in the cell. Here we just call the onEdited method of the cell that is edited, which we explained above. The samples handles this way a lot of events: nodeDeleted, linkCreated, nodeModified and many more. You can check them in the source code provided with the sample. The org chart uses the predefined TreeLayout to arrange the diagram. It is ideal for hierarchical types of charts because it neatly arranges all nodes from a given level in a row/column based on the direction set. It is called not only at the beginning but also each time a new node is created or deleted, link is created and/or deleted as well when link or node is edited. New nodes, as you already know are created by the user with a right mouse button click on any node. If a link is deleted, the node is detached from the hierarchy and the user should drop it over an existing node to indicate its place in the hierarchy. We continue the ServerLoad tutorial with the diagram. As with the line chart, we create a diagram object using the canvas id from the html page. Then we make some link customization: we set the base and head shape with setBaseShape and setHeadShape to “Arrow” to indicate that data flows in two directions between servers. As you see it is very easy to apply a layout with the diagramming control. 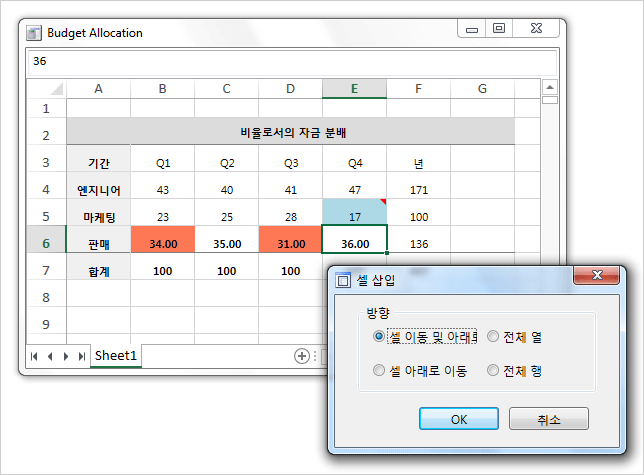 You just create an instance of the layout, set the properties of your choice and call arrange (). In our case we need the layout direction to be LayoutDirection.TopToBottom We also adjust the nodeDistance and layerDistance and set the number of siftingRounds (attempts to unwind split links) to 0. The diagram is meant to be interactive. We use the linkSelected and clicked events to handle selection of links and click on an area of the diagram, unoccupied by any items. All this is followed by a call to the draw method that repaints the chart. /* bolden the two major series, the others should be very thin. Note that we’ve used the setLocked property of the link and have set it to true. This means the link cannot participate in user interaction – it can’t be selected, moved, resized. That’s what we want. Use this link to download the full sample with all necessary libraries and scripts. You can also fork it from GitHub. In two blog posts we will look at the main steps to create a sample server load web application. We will use the chart, gauge and diagram libraries. The data is simulated with random numbers. The chart shows number of users on a given connection between two stations in the network at each moment. The graphic includes data for the last 30 seconds. The diagram shows the servers and clients that build the network. By default the charts shows data only for the two most important connections, out of total 10. Users can select different connections and view their graphics. 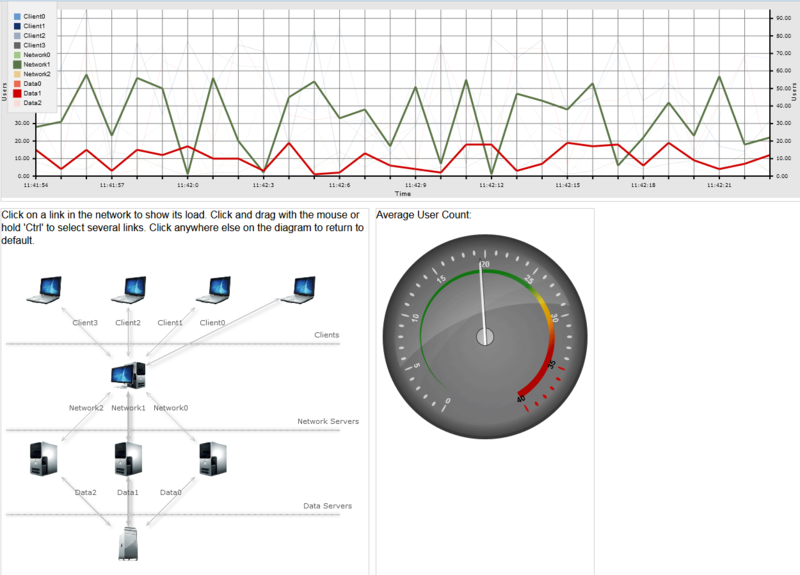 The gauge control provides data for the average count of users at any given moment. We create a blank HTML file and we create three HTML Canvas elements – one for each of the controls: chart, diagram, gauge. We specify that the first column on the second row would be twice wider than the other column. This is the diagram, and the other column is occupied by the gauge. Note the id=”lineChart” attribute – we will use the id to initialize the LineChart object in the *.js file. The diagram and gauge Canvas instances also have id-s.
Before the method we declare a global variable for the LineChart. We need to access it in the diagram file so it must have a global visibility. We will use two Events – raised before the background was painted and before the pointer was painted – to customize how the gauge background and pointer look. The setXLabels method takes care of the custom labels at the X-axis. At each 3rd call, it removes the first three values and adds three new ones: one with the current time stamp and two more as empty strings. //tell the series that the labels are for the X-axis. Finally, let’s look at the styling of the series. We keep the brushes in a list. The colors for those brushes are stored in a list with lists – each one with three elements for the red, green and blue values of the color. What we actually do to show the graphics of the connections that are selected in the diagram is thicken the strokes for those line graphics and set the thickness to the rest to 0.15 to make them barely visible. We do that by using the thicknesses property of the PerSeriesStyle class that we use for styling the chart. Only the 5th and 8th thickness are set to 3, the others are almost zero – enough to draw the silhouettes of the graphics. In part I of the Ticket Booking System blog post we discussed the controls used in the software and how we generate and arrange the hall seats. Now let’s get deeper into the details on how we retrieve the data and how we customize the controls. We have a table for the event type (ballet, concert, opera etc. ), a table for the events (Swan Lake ballet, Mozart concert, La Traviata oepra etc. ), a table for the performances (an event with a date) and a table for the tickets that were sold. The performance table has a column for the base price of the tickets. The hall is divided into 3 sections according to the price of the tickets – the Performance table stores the price for the cheapest category. The other two categories are calculated according to the base price. We read all records in the Performances table and create an Appointment for each one. The start date of the event is the field from the database. We add to it 2 hours as duration, otherwise the event wouldn’t show up. The brush of the Appointment depends on the type of the event. The appointment does not show any text, but the event title serves as a description. 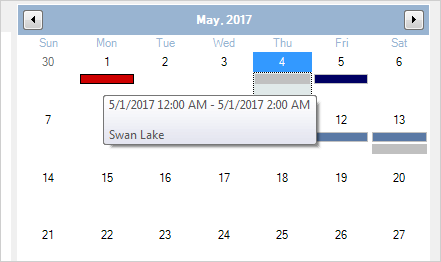 As a rule the calendar control renders an Appointment‘s description as a tooltip when the user hovers the item. In order to identify the location of a seat we assign an instance of the Seat structure as an Id to the ShapeNode that represents the seat. The Seat tag of the ShapeNode is calculated based on its location in the hall. 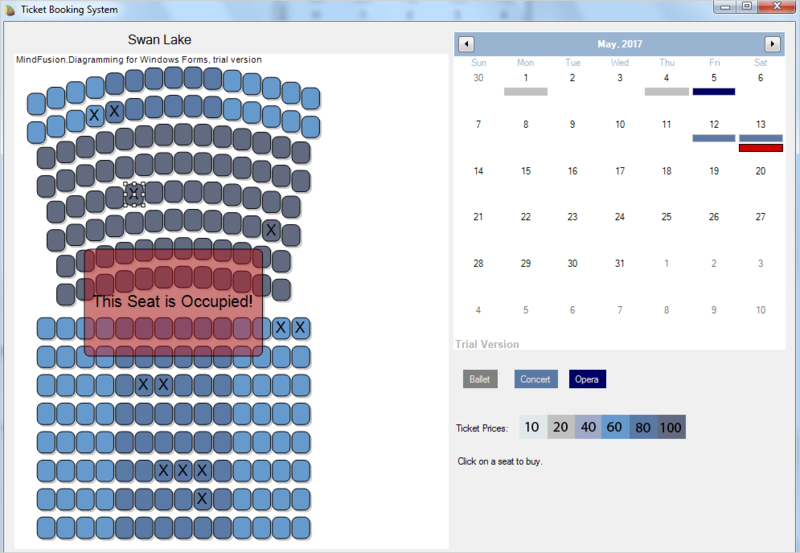 It is the coefficient, which multiplied by the base price for this performance gives us the final price for this seat. 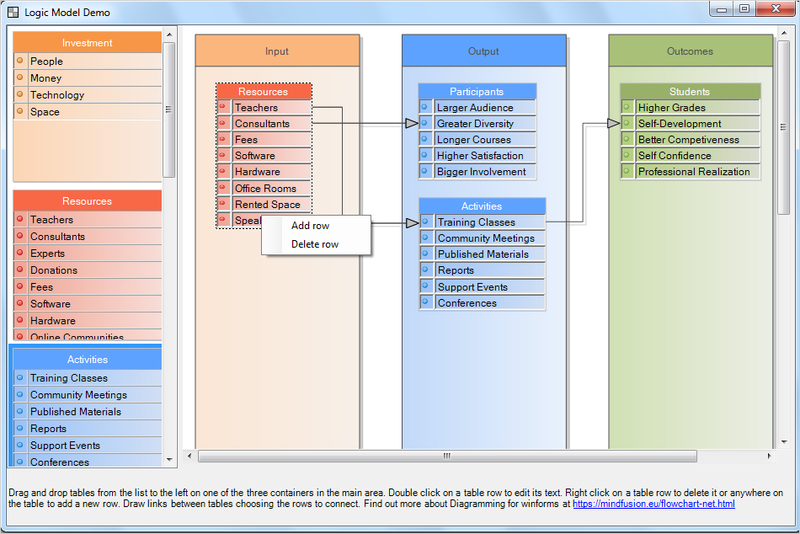 The sample uses the Diagramming and Scheduling controls from the MindFusion WinForms Pack. If you have questions regarding the sample or the components do not hesitate to post them on the MindFusion discussion board. Here is a link to Part I: Overview of chart elements, the dashboard, plot and axes. Here we indicate that this SimpleSeries provides labels for the YAxis with the getSupportedLabels override, which in our case returns LabelKinds.YAxisLabel. The label is returned by the getLabel method. That’s the end of this tutorial. Here is the link to download the full sample. About Charting for Java: MindFusion.Charting for Java Swing is a multipurpose graphics library that lets you create and customize a large variety of chart types: bar, column, pie, doughnut, radar, polar etc., candlestick financial charts, gauges and dashboards with dynamic layout of their components. The library boasts a smart API which lets you combine and arrange multiple lots, axes, legends, images and other chart components. The chart appearance can be customized on multiple levels – from properties applied on a single element to global themes reused by all charts and series. Charts use a uniform Series interface for reading data and labels. 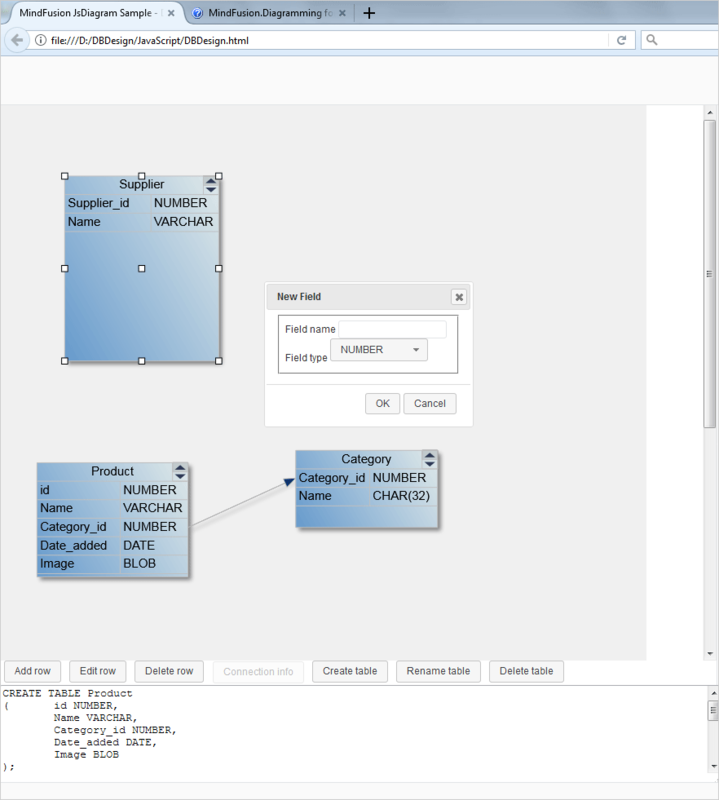 You can implement the interface and create custom Series that matches your data source. Written in pure Java, this tool provides every type of Java Swing application with powerful charting capabilities. Read more about the component from here. In part one we will create the hall scheme and the calendar with the events. 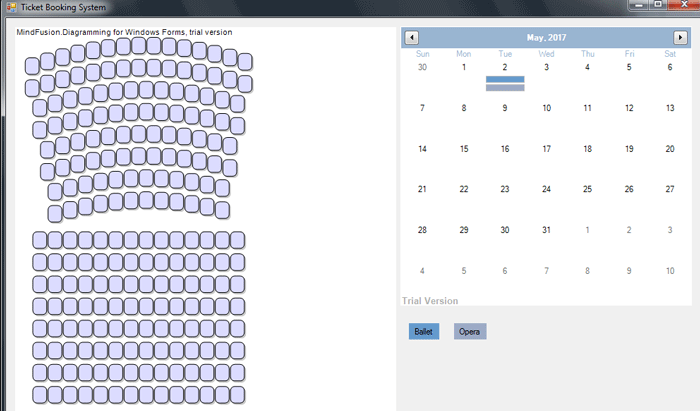 In part II we add a database back end and customize the seats according to their price. Then we click on the Toolbox pane -> Choose Items -> Browse and we add the MindFusion.Diagramming.WinForms and MindFusion.Scheduling dll-s. They add a list of components, but we select the DiagramView and the Calendar controls and drop them onto the form. 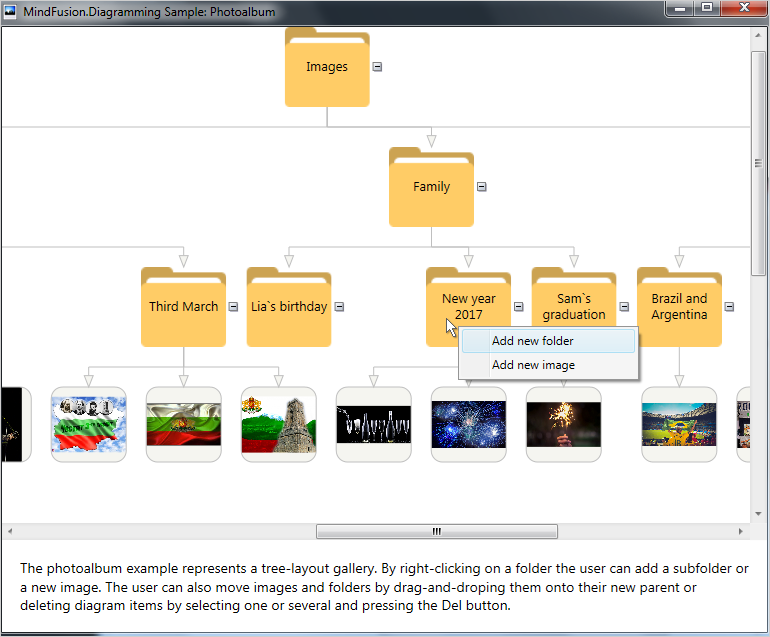 The DiagramView creates automatically the diagram instance that it renders. We provide the method with an array of integers that indicate the number of seats on each row in the section. Then is the offset to the top and the size of each seat. The xPadding and yPadding arguments indicate the space between two adjacent seats. The last argument indicates how curved the row of seats is. The nodes are created with Factory.CreateShapeNode method which uses the Factory helper class of the diagram component. The CreateShapeNode method creates and adds the newly created nodes to the Nodes collection of the diagram. The Scheduling for WinForms and Diagramming for WinForms components are part of MindFusion WinForms control suite – the perfect set of tools to help you build any type of WinForms software fast and easy. Find out more about MindFusion WinForms pack here.